New Delhi: All India Majlis-e-Ittehadul Muslimeen (AIMIM) chief Asaduddin Owaisi will undertake an extensive tour of Uttar Pradesh over a period of four months beginning in January next year to prepare ground for the Assembly polls in state in 2017. Till now, Akhilesh Yadav government has not given permission to Owaisi to address public rallies in UP. During a meeting of party’s office bearers from 26 districts of western UP held at Delhi on Monday, Owaisi announced that he will begin his tour after January 20. The focus of the tour will remain on Dalit-Muslim combination as per the party’s slogan — Jai Bheem-Jai Meem. 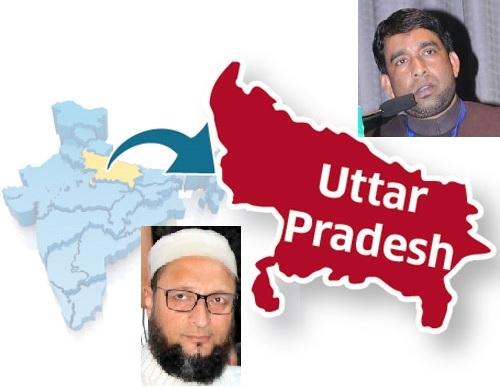 During the meeting at Delhi on Monday, Owaisi also told his workers that AIMIM will contest the bypolls to three Assembly seats — Deoband, Muzaffarnagar and Milkipur (Faizabad district). The party will name two Dalit candidates and a Muslim for the three seats. “We know that these seats fall under general category but Dalits can contest and we will field them,” Shaukat Ali, AIMIM’s UP president said. As Akhilesh Yadav government is not allowing him to hold public meetings in the state so he will be coming to the state and visit party workers at their residences. During his tour, Owaisi will discuss about AIMIM’s strategy for coming polls.